People who don't understand art often say that dance isn't a practical career choice. If you have ever heard that statement and thought to yourself "practical is boring!" then the pre-professional track is for you. Lucky for us, we're in the art hub city of Houston, where "practical" can be exciting and full of passion! Let us show you how your dreams and ambitions in the arts can become a reliable reality!! This combination of classes will provide students with extensive knowledge about the dance world, where it came from and where it is now. This track will prepare students for a career in the arts community by teaching them how to build their resumes, informing them about current audition expectations and giving them access to advice from Houston's leading choreographers through their adviser. Throughout the program students will learn about dance construction and appreciation as they discover their direction in the arts. RADIX is a traveling pre-professional dance company lead by instructor Mrs. Courtney Clements. This group is a tight-knit ensemble filled with passionate dancers and innovators who are ready to take their dance education experience to the next level. Members of this company will have to undergo an extensive audition process and be in the "Advanced" level (unless otherwise determined by a director). RADIX will be performing regularly in the community and will be showcased online as well. Improvisation – the process of spontaneously creating movement. Development of improvised movement material is facilitated through a variety of creative explorations including body mapping through levels, shape and dynamics schema. Dance Comprehension – the exploration of dance history and dance development. This is the most advanced portion of the pre-professional track and is only available for advanced level students that have already been enrolled in Improvisation in a previous year. Ballet - a classical style of expressive dance based on precise conventional steps, with gestures and movements of grace and fluidity. This genre of dance is the basis for all other forms of dance. (Class attire – black leotard, pink tights, pink ballet shoes, sheer ballet skirt (optional), and hair secured in a bun or with a head band for short hair) No jewelry. Tap – a step-dance in which the performer wears shoes equipped with taps that make a rhythmic sound on the stage. (Class attire – leotard, tights, jazz pants or dance shorts paired with tights and tap shoes). Jazz – Modern day jazz dancing is a mix of ballet and hip hop. Usually performed to jazz music, fast- beat ballet music, or slow- paced hip hop music. (Class attire – leotard, tights, jazz pants or dance shorts paired with tights, and jazz shoes). 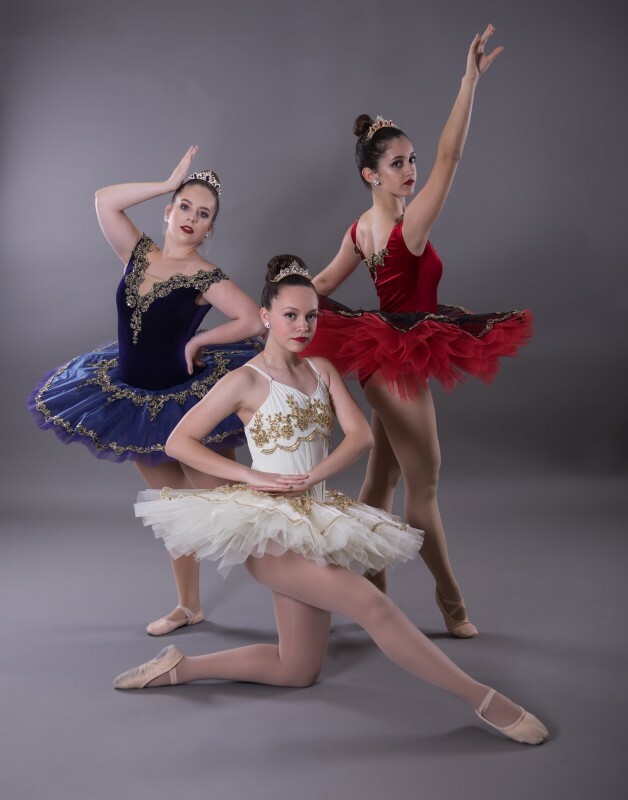 Contemporary – a style of expressive dance that combines elements of several dance genres including modern, jazz, lyrical and classical ballet while learning to connect the mind and the body through fluid dance movements. (Class attire – leotard, tights, lyrical sandals, and hair secured away from the face).